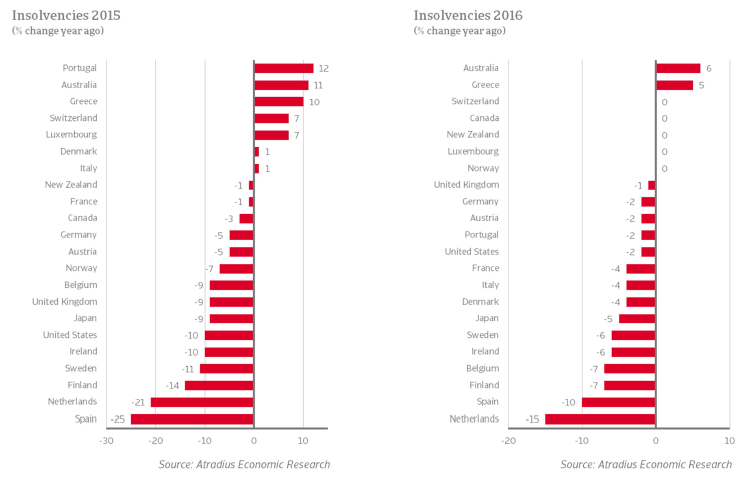 Atradius forecasts very little to no improvement in insolvencies in the majority of advanced markets in 2016. Only a 3% improvement is expected, the lowest since 2012. The challenging external environment and low commodity prices are increasing business risks and bankruptcies could pick up in spite of strengthening domestic economies. Across many advanced markets, business risks are expected to increase in 2016 after the positive developments seen in 2015. 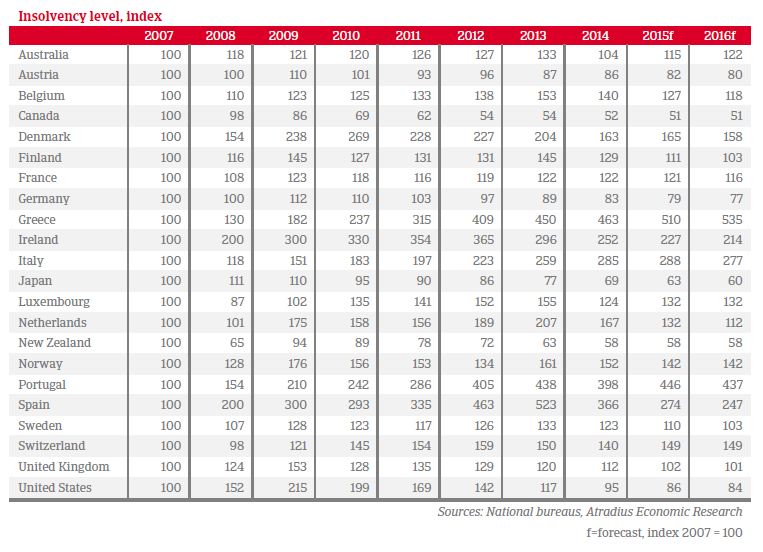 Atradius forecasts very little to no improvement in the majority of markets in 2016, with risks to the outlook sharply to the downside – stemming from low oil prices, US monetary normalisation and the uncertain impacts of a slowdown in emerging markets. The low level of commodity prices is expected to continue to weigh on the outlook for commodity-dependent economies. These include Australia and Norway where commodity-related exports account for more than 60% of the total. While both economies are slowly adjusting, aided by depreciating currencies and loosening monetary policy, bankruptcies are forecast to rise 6% in Australia and stay flat in Norway. Absolute levels remain above pre-crisis levels in both economies: +22% and +42% respectively. North America will also face pressure from low oil prices as investment in the relatively expensive American and Canadian oil stays restrained. Canada is forecast to see no change in insolvencies and the United States is forecast to see a drop of only 2%. The Federal Reserve’s monetary tightening cycle could challenge businesses in the US by making commercial loans more expensive. Monetary policy divergence between the US and most other advanced markets, however, makes US assets more attractive for international investors, which should improve liquidity overall in the US but may have the opposite effect elsewhere. Particularly for the Asia-Pacific countries – Australia, Japan and New Zealand – the turmoil in emerging markets, driven by the slowdown in China and low commodity prices, will be an obstacle for firms. Lower demand in emerging markets, exacerbated by weaker domestic currencies, will also continue to drag on exporting businesses in the eurozone, US, UK and in Denmark, where insolvencies remain 58% higher than in 2007. In line with the solid economic recovery in the eurozone, the business environment is forecast to see another year of improvements. With only -5% change in aggregate insolvencies, the improvement is half of what it was in 2014, when the economy was much more fragile. The total number of businesses forecast to go bankrupt in 2016 is also still 67% higher than in 2007. Greece, in particular, is weighing on the eurozone’s outlook with a further 5% increase in business failures forecast for 2016, after 10% estimated in 2015. Political uncertainty, low consumption and capital controls continue to create a very difficult operating environment for the small and medium-sized enterprises that dominate Greece’s economy. 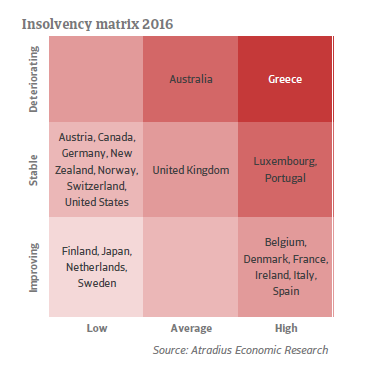 The ongoing Greek government debt crisis has driven national insolvency rates to more than five times the level in 2007. The level of business bankruptcies around the periphery of the Eurozone remain remarkably higher than before the onset of the global financial crisis. 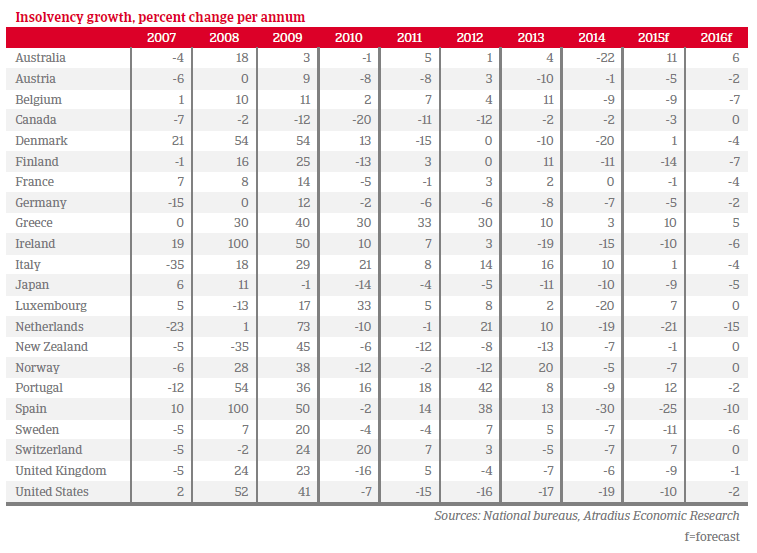 Portugal’s level is 4.4 times higher than in 2007; Italy’s is 2.8; and Spain’s is 2.5. Overall, the Netherlands and Spain are forecast to see the most improvement again in 2016. The booming economic recovery in Ireland, the other top runner of 2015, is expected to slow down slightly this year, with insolvencies only forecast to fall 6% and, like in Spain, to remain over twice as high as before the debt crisis. Business insolvencies expected to increase 6% in 2016 as the slump in the mining sector continues.